If you know your roof is leaking you know it is time to replace the shingles. But there are other obvious signs your roof needs replacing. If you can see light through your roof when you are in your attic or if your roof is starting to sag it is time to replace the roof. If you notice any of these signs it is time to get your roof replaced as soon as possible. Many people attempt to replace their roof themselves but this often results in a more problems. Unless the homeowner has some experience replacing shingles, the job won’t be completed properly. Homeowners without roofing experience should contact a professional to get the job done properly contact a professional roofing contractor. Call us today at (416) 477-1070 to set up an appointment for an estimate. 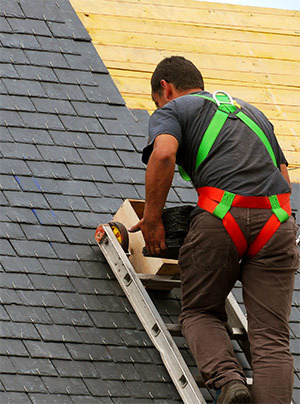 Our roofing professionals will give you an honest estimate and get the job done on time. Our company prides itself on providing our clients with excellent service. All of our roofing professional follow a set protocol, use high quality material, and get the roof done on time as promised. The roofing material we will use on your roof comes with a 25 year warranty and we guarantee the quality of our work. Call Quality iRoofing to talk to one our roofing professionals and get your shingle roof replacement done right!